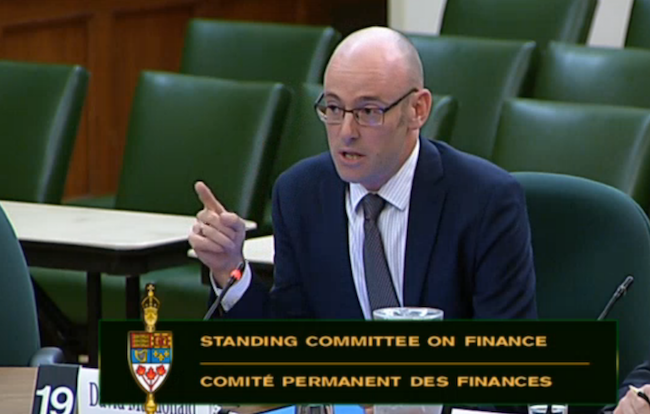 CCPA’s David Macdonald, Senior Economist, appeared as a witness on budget implementation Bill C-44 May 16, before the House Standing Committee on Finance. Image via ParlVu. As stakeholders gather before the House Standing Committee on Finance to comment on federal budget implementation Bill C-44 this week, one aspect of the legislation–proposed creation of the Canada Infrastructure Bank–is drawing significant attention. Overall, Bill C-44 closes several of the “boutique tax cuts” that have been opened over past years. I hope that policymakers tackle several of the larger and more regressive tax loopholes, including the stock option deduction and the capital gains inclusion rate. The bill’s inclusion of an Infrastructure Bank proposal is now in the spotlight, as media reports have surfaced that suggest members of the Senate are privately discussing whether to split C-44 in order to spend more time studying the Bank. In light of the current landscape, now is a crucial time to ask who exactly will benefit from the Infrastructure Bank, as proposed in Bill C-44: investors or Canadian municipalities and end-users? First, it’s important to note, that whatever the structure of an Infrastructure Bank, loans are a poor substitute for federal funding. There has been a substantial shift in infrastructure investment and responsibility over the past half century. In 1955, the federal government spent 35% of every infrastructure dollar, today it spends closer to 15%. It is municipalities who have picked up the slack: they used to spend a quarter of every infrastructure dollar, now they spend close to half. Provincial contributions remained roughly the same. Still, the federal government continues to pay the lowest interest rates of any level of government and enjoys the broadest tax base. Municipalities on the other hand face the highest interest rates and the smallest tax base. For example, as of Tuesday, the five year interest rate for the City of Ottawa was 2.25% and for Halton Region was 2.54%. On the other hand, the five year interest rate for the federal government was 0.82%, roughly 1.5 percentage points lower. This leads to fewer dollars spent on infrastructure as the costs are shifted to the level of government least able to pay for them. The municipal infrastructure deficit needs to be tackled with direct federal funding, not just loans. Smaller municipalities or those unfamiliar with larger projects would particularly benefit from an Infrastructure Bank focused on: 1) lowering interest rates and 2) facilitating the borrowing process. Interestingly, neither of these straightforward purposes are part of the proposed “functions” listed for the Infrastructure Bank in Bill C-44. As with a mortgage, higher interest rates mean higher costs for cities and/or higher user fees for Canadians over the life of a project, possibly doubling the cost. An infrastructure bank could effectively lower city borrowing costs to close to the federal rate. For its part, the federal borrowing rate is close to a record low, reflecting the incredible demand for Government of Canada bonds. Put another way, investors are desperate for more federal bonds, driving their price up and their yield down. An infrastructure bank could take advantage of this and pass the savings on to cities. However, I’m concerned that, as structured, the Infrastructure Bank would not achieve the goal of reducing borrowing costs for cities, but in fact would do the exact opposite. The proposed Infrastructure Bank appears designed to serve the needs of investors, not those of cities. In fact, the input of any level of government is explicitly (and oddly) not a necessary requirement for accessing funds through the Infrastructure Bank. It appears that public private partnerships (P3s), and not low-cost financing, will be the focus of the bank. The likely impact will be interest rates of 7 -9% on Infrastructure Bank projects, instead of 0.8 per cent, the current federal borrowing rate. In other words, the proposed structure will increase interest costs by a factor of 10: 8% instead of 0.8%. Those higher costs will be paid by governments, by higher user fees, or both. Municipalities are not blind to this issue, preferring public financing due to its lower costs and improved control over public infrastructure. This is not a hypothetical problem. In 2014, the Ontario Auditor General (OAG) examined $26 billion worth of P3 projects undertaken by the Government of Ontario, an amount similar to what the federal Infrastructure Bank is considering. She concluded that the P3 structure would add an extra $8 billion in costs over and above the $26 billion for the projects themselves, largely due to much higher interest rates compared to public financing. These much higher costs will be borne by the Ontario government and, ultimately, Ontarians so that P3 consortiums can increase their profits. I’d encourage policymakers to refocus the infrastructure bank on driving down interest rates for municipalities while accelerating their access to infrastructure loans. This refocusing of the Bank’s priorities on what cities need instead of what investors need will best serve Canadians by keeping costs and user fees down, while encouraging cities to use the Bank due to its competitive rates. David Macdonald is Senior Economist with the CCPA’s National Office. He appeared as a witness on budget implementation Bill C-44 May 16, before the House Standing Committee on Finance. You can watch his full remarks online here. We don’t even need this infrastructure bank, the whole bank is just a debt trap to benefit the investor class. We could just borrow from the Bank of Canada at 0% interest rate! It also owns a central bank that significantly funded infrastructure 1945 – 1975. When you hear PM Trudeau and Finance Minister Morneau making the absurd comment again and again that borrowing money from the Bank of Canada would be inflationary while borrowing the same amount of money from the Infrastructure Bank (at higher interest rates) would not be inflationary, you have to ask the question: Who are these guys working for, the people of Canada, or the Bankers? I think that’s the definition of a rhetorical question.